Phone holder that clip on the side of monitor. Enjoy watching both phone & monitor screen same time. Applicable for desktop monitor and laptop monitor. Adjustable for clipping on left or right side of monitor. Access for charging cable on phone holder. please insert silicon spacer to ensure sufficient clamping force. For slim or laptop monitor with thickness less than 8mm, please insert the silicon spacer to ensure sufficient clamping force. © 2017 by CYK STUDIO LTD. All rights reserved. 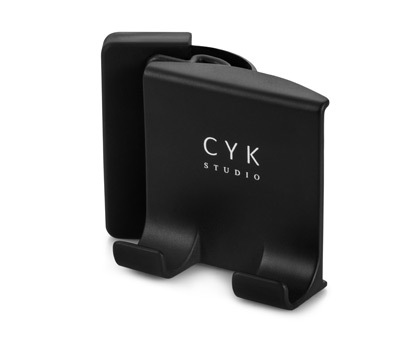 CYK STUDIO and other CYK STUDIO marks are owned by CYK STUDIO LTD and may be registered. All other trademarks are the property of their respective owners. Pictures of others products are for illustration purposes only. Copyright ? 2017 CYK STUDIO LIMITED. All right reserved.